Capture audio in any setting, from live music performance, drums with multiple mics to music rehearsals and songwriting, even audio for film and video. 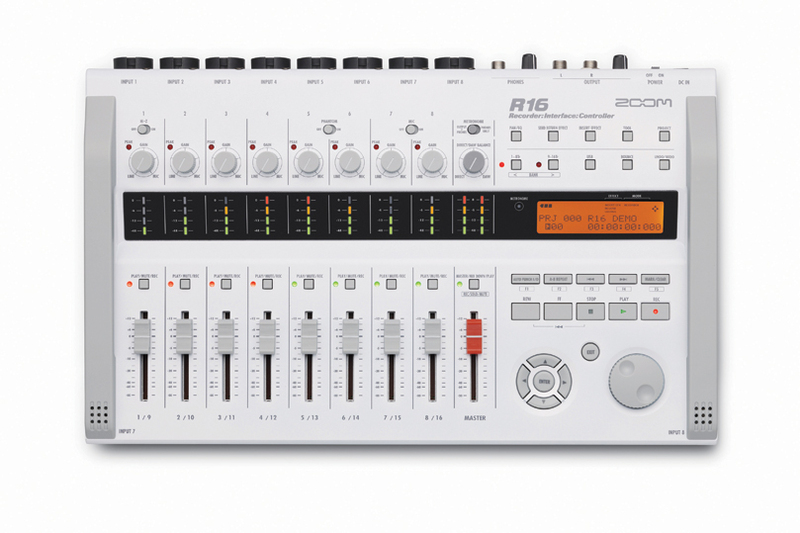 The R16's simultaneous 8-track capability makes professionalism easy. Playback up to 16 tracks using its 16/24-bit linear WAV format and 44.1kHz sampling rate. The R16 functions as an audio interface enabling direct input of sound to a computer. Support for high quality 24-bit/96kHz encoding ensures great sound. Eight input channels and two output channels can be used simultaneously. If you use the sampling rate of 44.1kHz, the internal DSP effects of the R16 are also usable on your computer tracks. A dedicated control lets you adjust the mixing balance between the DAW playback sound and the direct sound for monitoring. Transport and mixing operations of the DAW software can be controlled using the R16. This gives you greater control and a better feel for mixing. In Mackie Control emulation mode, major DAW applications such as Cubase, Logic, and Sonar are supported. The R16 is the first recorder that incorporates the ability to generate a synchronization signal based on USB data transfer timing*. By connecting two R16 units via USB, you can designate one to function as a USB host and the other as a USB slave, allowing synchronized transport operation. This lets you record on up to 16 tracks simultaneously to competently handle a live performance. * Synchronization accuracy has a tolerance of about 1 to 2 milliseconds. When you want to quickly record anything from songwriting ideas to ambient room audio, the R16's built-in set of stereo mics will come in handy. Vocals and acoustic instruments can be captured with excellent clarity. Because the R16 utilizes compact and readily available SD and SDHC memory cards as its recording media, there is no motor that can cause noise as with tape or discs. And you never need to worry about problems caused by external vibrations that can crash hard drives. Its eight combination mic/line input jacks can handle mics or line-level signals. Phantom power is provided on channels 5 and 6 for use with condenser mics, and the Hi-Z switch for channel 1 accommodates a guitar or bass. The R16 is ready for any kind of input source. A dedicated master track lets you do the final mixdown right on the R16 without a separate master recorder. With sequence play, several projects can be mastered together and played automatically. And you can create playlists for finished songs in any order. The R16 comes preprogrammed with 135 types of digital effects for recording, mixing, and mastering. The insert effect has seven modules with algorithms optimized for guitar, bass and vocals. In addition, two send/return effects are also available, so that you can use up to three effects simultaneously. The R16 also comes with models of 18 different guitar amps such as Fender, Marshall, Vox and Mesa Boogie, and 6 bass amps such as Ampeg, Bassman and Hartke. A compressor and equalizer effect that handles 8 channels simultaneously provides further flexibility. *Manufacturer names and product names are trademarks or registered trademarks of their respective owners. The names are used only to illustrate sonic characteristics and do not indicate any affiliation with the Zoom Corporation. The R16's built-in tuner is great for quickly tuning an instrument or checking the pitch of vocals. During recording, the metronome provides a click track for your drummer and is also handy for practice. The metronome sound can be sent to the headphones, letting you use a previously recorded backing track on stage during a performance. Set up to 100 marker points and directly locate them whenever you want. Other convenient functions for editing include A-B repeat playback and auto punch-in/out, making it easy to re-track part of the recording. The R16 can be powered from the supplied AC adaptor or six AA/LR6 batteries. A set of batteries will last for about four and a half hours, and because they are standard batteries, changing them is always easy and convenient. The audio interface and control surface functions can also be operated on USB bus power, providing another power option. Because the R16 has a USB 2.0 Hi-Speed compatible port, file transfer to a computer is quick and painless. Computer-based tasks such as editing with DAW software, burning your original CDs and importing WAV files are integrated smoothly into your workflow. A USB flash drive or large-capacity external hard disk* can be plugged into the USB port of the R16. This lets you quickly distribute a recording to band members after a rehearsal session or make a backup of your recordings even when you're not near a computer. *Because USB bus power for external hard disks is not supplied, a separate power source is required. Cubase LE 4 is a powerful music production system that can handle recording, editing, and mixing tasks both for audio and for MIDI. It incorporates the same audio engine as the multi-award winning, higher-level version Cubase 4, and is ideal as an entry into computer-based music production.